Be sure to follow me on Pinterest for more of my Gardening posts! We have a lower area where we planted sod and a flower garden. Then on the upper level we did mainly mulch. To add some color to that we build these fun Flower Boxes. VERY easy and inexpensive to make too! You can easily grab the supplies from your local Home Depot. All of which can be gotten for under $15 at Home Depot! And yet makes such a BIG difference! All you have to do is measure and cut your wood, and nail the edges together to get your box. We did two different sizes, 3×2 and 3×3. 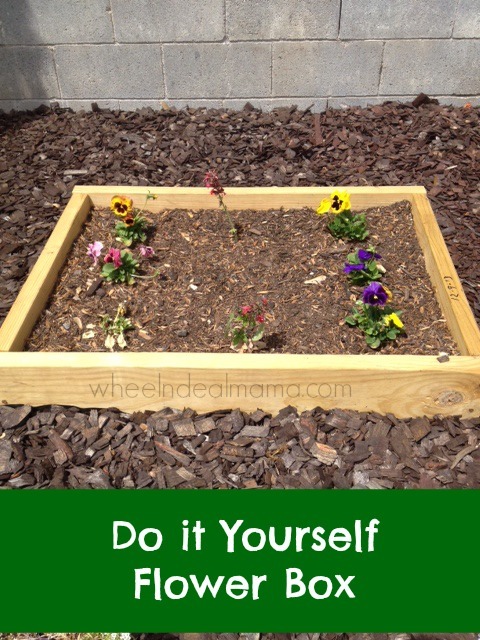 Once you have your square you can place, fill with the soil and plant! Such a simple and easy DIY project but I think it makes a HUGE difference in the look of the backyard. We made three for the upper area. We also did a nice little flower garden to the side of our sod, most of which we got from Home Depot, they have some very pretty flowers! Home Depot is offering up $10 off any $100 purchase through April 27. Just use the promo code SPRINGHD at checkout and you will get that savings! This would be perfect to add to your backyard decor or for any other project you may have going on around the house. Second? Savings.com is giving away $3000 in Home Depot gift cards over the next three days!!! 150 $20 gift cards! So you have decent chances at winning too! Plus, it is VERY easy to enter. Just head over here and enter your email! Hopefully a few of you win! At 7:00 PM EST on each day the sweepstakes is running (Monday the 21st, Tuesday the 22nd and Wednesday the 23rd) 50 of the winners will be selected and $1,000 dollars worth of gift cards will be given out. Readers can enter the sweepstakes once a day, with the giveaway being reset at 7:01 PM EST on Monday and Tuesday. This means everyone can enter this sweepstakes 3 times – potentially allowing someone to win $60 worth of gift cards. Savings.com will notify the winners and send them their gift card code via the email address they use to enter. The giveaway will start on Monday, April 21 at 9:30 AM EST and end on Wednesday, April 23 at 7:00 PM EST. Good luck!! This post has been sponsored by Savings.com. As always, opinions are 100% my own!